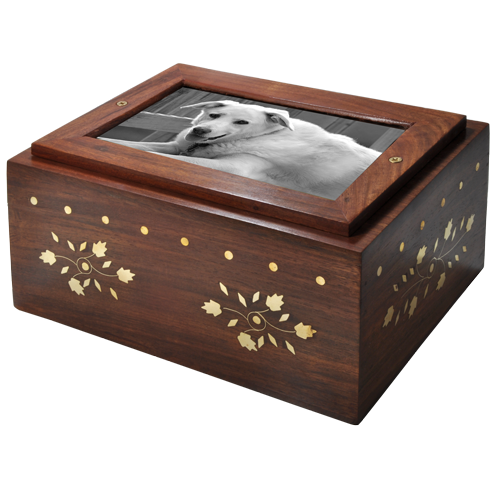 This handsome wood urn is finished with decorative brass flourishes and features a photo frame on top. May be used to hold partial ashes or keepsake items such as a collar, id tags, photos or any small item you would like to keep in a safe place. Urn access at bottom with slide opening. This beautiful memorial chest with hinged opening can be engraved directly into wood on top (see photos). 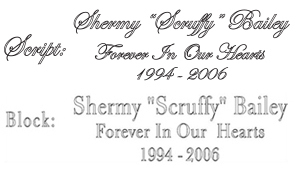 Clip art is also available to enhance engraving. A perfect memorial choice to keep the memory close. Approximately 50 cubic inches. Will hold the ashes of a pet that weighed 50 lbs or less at the time of passing. Use your own photo to place in window. Or submit your digital photo to create a black & white photo print on acid free, bright gloss paper for an additional cost.If your file is 1 MB or less, use the File Upload feature. For files larger than 1 MB, place your order, then submit your high resolution digital file in JPG format to service@newmemorialsdirect.com with order number. What if I have a small pet? 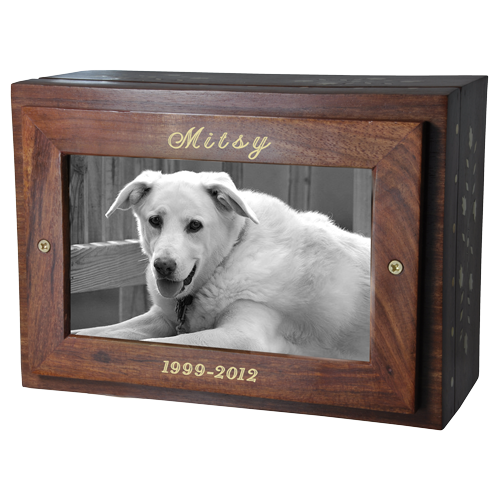 You may place precious ashes plus small keepsakes such as id tags, collar and leash depending on size of pet.